Features the vibrant dot design art that is so well known from the aboriginal cultures of Australia. 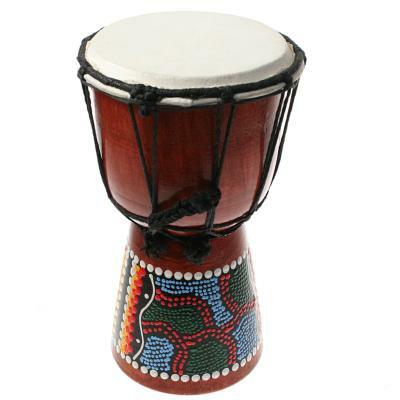 A djembe is a rope-tuned skin-covered goblet drum played with bare hands, originally from West Africa. According to the Bambara people in Mali, the name of the djembe comes from the saying "Anke djé, anke bé" which translates to "everyone gather together in peace" and defines the drum's purpose. We love this description because what’s better than having all your mates round for an impromptu jam and enjoying life together?? Our Djembe drums are handmade in Bali to this original African design whilst incorporating the vibrant dot design art that is so well known from the aboriginal cultures of Australia.